And, as loyal readers will know The Immortal Jukebox has a tradition of marking Christmas Tide with special Posts. Songs of celebration and reflection from many genres and from artists famous and obscure. From today you can look forward to a Post every other day. So, let’s start with C for the great Chuck Berry who died this year. Now, as we all Chuck was a multi MVP, All Star and indeed a by acclamation inductee Hall of Fame Songwriter. Chuck, when he put his diamond sharp mind to it was also a gifted and sensitive interpreter of other writers’ songs. In the first flourish of his epochal years recording for Chess Records Chuck laid down two superb Christmas singles showcasing his skills as a guitarist and singer. I like to clear a mighty big dancing space before I put this one on and I’d advise you to do the same if you don’t want your Christmas decorations to come crashing down around you! Chuck cracks the whip and boy don’t those reindeer speed like a Saber Jet through the firmament! Johnny Marks was a Christmas Song specialist and I think we can allow that he had really got the hang of it when you consider that in addition to Run Run Rudolph he also wrote, ‘Rudolph The Red Nosed Reindeer’, ‘Rockin’ Around The Christmas Tree’ and, ‘A Holly Jolly Christmas’. What Chuck and the storied Chess Studio team brought to Run Run Rudolph was an irresistible brio that grips from the get go and doesn’t let up till the son of a gun hits the run off groove. Just so you know you’re in good company going wild to Run Run Rudolph it was this song that Keith Richard chose to record for his first solo single in 1978 (and a lovely, extra loud, extra louche, job he made of it too). Keith, surely, was the Boy Child who wanted a Rock ‘n’ Roll Record Guitar! Chuck, being the fond of a greenback, canny operator that he was, took the arrangement they came up with here wholesale for his own, ‘Little Queenie’ when there would be no question about whose bank account the songwriting royalties would roll into! Chuck has a powerful case for being the inventor of Rock ‘n’ Roll songwriting and Guitar style. Yet, neither of these gifts came out of nowhere. Chuck loved, understood and could integrate into his own sound The Blues, Swinging Jazz, Country Music and the Latin rhythms coming from South of the Rio Grande and from Cuba and the Islands. So, when in 1947 he heard Charles Brown singing, ‘Merry Christmas Baby’ his ears must have pricked up as he thought, ‘Now that’s one I could do to show off my after midnight singing and guitar style’. You can settle back in your armchair for this one and maybe unstopper the Brandy Bottle. Well, don’t that go down smoothly. Chuck’s perfectly weighted vocal and hush don’t wake the baby guitar is perfectly complemented by Johnnie Johnson’s lyrical and lush piano. One to listen to thrice before you move on! Now a wonderful Transatlantic partnership between two maverick talents. First, Ireland’s most successful cultural crusaders along with the manufacturers of Guinness – The Chieftains. Joined here by the bohemian brilliance of Rickie Lee Jones. The space they afford each other allows each to shine. Rickie embodies the weary world and the thrill of hope even as The Chieftains evoke the bright shining stars and the glorious new Morn. In memory of my friend, Vincent Roche (RIP) who was one of nature’s gentlemen. A craftsman, a scholar of music and horseflesh and a man of wry humour and quiet dignity. Vincent was a proud Irishman from Foxford in the County of Mayo. Today, in his honour, I feature a luminous performance of, ‘Carrickfergus’ by the greatest singer Ireland has ever produced, Van Morrison, accompanied by the legendary Chieftains who provide the sympathetic melodic and rhythmic ground against which Van weaves his profound magic. Van makes emotionally real the knowledge we have in our bones that our relations and dearest friends are all bound to pass on like the melting snow. Treasure them while you share the same stretch of road. Wherever we wander most of us keep an image in our hearts of the home place and all of us are mesmerised by the waves of the salty sea ebbing and flowing as they have done for millennia before we were born and as they will do long after we are gone. P.S. Those of you interested in my more literary efforts and Ireland might like to look up the, ‘Once In A Blue Moon A Poem’ post below. Today’s music comes from two countries: Russia and Ireland which share a reverence for poets and prophets, visionaries, bards and shamans. Both have produced more than their fair share of saints, scholars and wayward genuises. Still, veil-piercing poetry and song are central to the cultural life and achievements of Ireland and Russia. Both peoples love to carouse until they are stupefied yet both are capable of being stilled to silence and tears by a simple lyric or an exquisite slow air. My first choice today is, ‘The Wexford Carol’ performed by the veritable custodians of Ireland’s traditional music, The Chieftains (here accompanied by a Texas rose, Nanci Griffith). The Chieftains play with an authority born of thousands of hours of perfecting their craft as traditional musicians – always respectful of the source material while being alert to each other’s role in bringing a tune to shimmering life. The Chieftains, led by Piper Paddy Moloney, who has proved to be a natural born networker, have recorded many inspired collaborations with leading artists in many musical genres (though their greatest collaboration is probably with an artist from their own island – Van Morrison). Next, from a powerhouse of Otthodox Russian monasticism, ‘The Song Of The Magi’. The choir is from the Trinity Lavra (monastery/hermitage) of St Sergius in Sergiyev Posad some 50 miles from Moscow. This has to be the sound of the breath of the Russian soul. Russian Othodox services provide doorways to contemplate the divine – an opportunity in stillness to be lifted into a different realm of being. Giving ourselves over to such an experience can be profoundly uplifting and over time transformative. Russian spirituality opens itself to mystery and awe accepting that grace cannot be willed but only gratefully accepted. 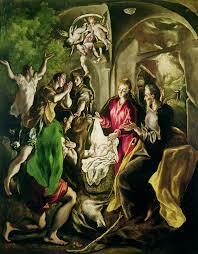 The Magi travelled long miles in search of a new kind of King and gave their gifts to a babe in a manger. Perhaps, listening to this work we could learn to give the gift of an attentive soul.